Living a Fit and Full Life: Family Flora Probiotic + Prebiotics Support Your Health, Vitality and Quality of Life! Family Flora Probiotic + Prebiotics Support Your Health, Vitality and Quality of Life! Family Flora is a line of products from America’s Naturals. Our company is made up of natural product experts, researchers and scientists, all united by a common cause: to better understand the human microbiome, and to research and develop probiotic and prebiotic supplements that can help support our customers’ health, vitality and quality of life. Your body is in perfect harmony, allowing you to move through each day with a special kind of peace-of-mind. Your healthy routine makes you perfect inside, and that gives you an edge on everything you do. Maintain your edge with Family Flora Daily Balance Probiotic + Prebiotic, specially formulated to support digestion and gut health. Good gut health is essential to proper digestion, vitamin and nutrient absorption, and a strong immune system. The body’s microbiome is made up of over 1 trillion cells. These “good bacteria” are a part of our overall defense against illness. The foods we eat and drink and our lifestyle can interrupt this inner harmony. Our Daily Balance Probiotic + Prebiotic formula is a perfect everyday method to support a vibrant microbiome and digestive balance, delivering 15 billion CFU, three-culture combination plus prebiotic formula. • Fun Stickers in Every Box! One For Each Day! Family Flora Probiotic + Prebiotics are amazing! I've been using prebiotics for sometime now and only recently have I learned a little about prebiotics and how important getting both are. 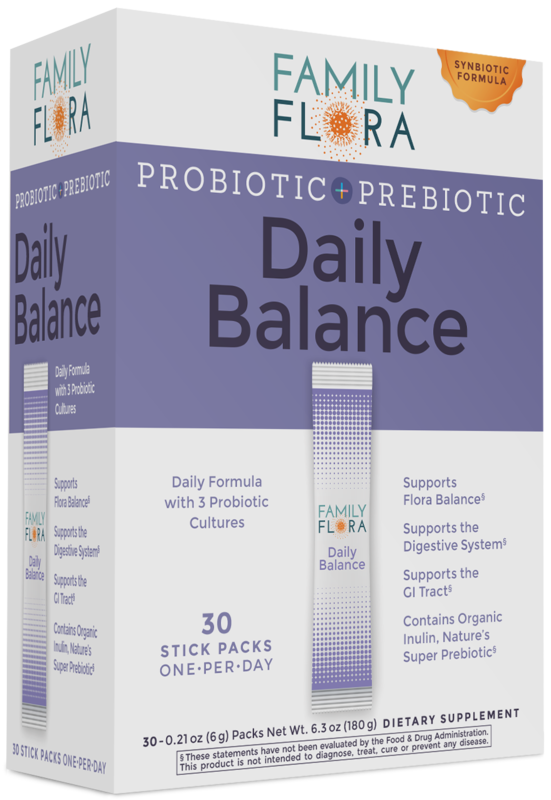 With Family Flora Probiotic + Prebiotics Daily Balance and Junior Daily Balance you get them both and boy can this make a difference in your life. Good gut health is essential to proper digestion, vitamin and nutrient absorption, and a strong immune system. 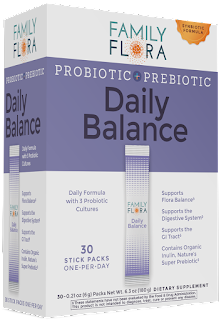 Daily Balance by Family Flora contain 3 Probiotic Cultures plus 1 Super Prebiotic. Daily Balance by Family Flora contains no artificial flavors or sweeteners and is Non-GMO, kosher and sodium-free. I also love that they come in convenient, easy-dose stick packs that are perfect for taking with you in your purse or diaper bag. 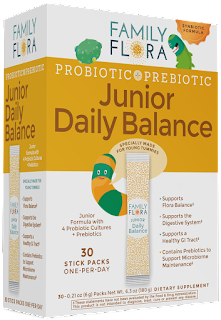 Junior Daily Balance by Family Flora contains 4 Probiotic Cultures plus A Super Prebiotic and is perfect for kids 2-14. 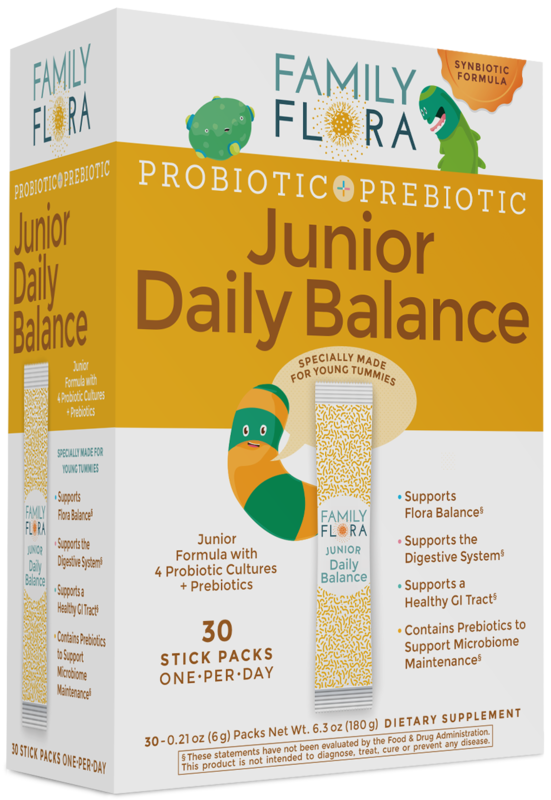 Junior Daily Balance by Family Flora also contains no artificial flavors or sweeteners and is Non-GMO, kosher and sodium-free. Another great thing about Junior Daily Balance by Family Flora is that they contain fun stickers in every box which makes them extra fun for kids. Family Flora Probiotic + Prebiotics are the perfect way to keep your families gut health in check and I highly recommend their products! Click HERE to find a store near you that sells Family Flora! Click HERE to learn more about Family Flora! Follow Family Flora on social media!